Building multi-lingual websites involves a heavy load of content translation, as the website owners want to make their content easily understandable for all, whatever their nationality might be . Furthermore, translating a website into various languages requires a high competency in technical layouts and formatting. In some cases, language translators might need training before they set add translated text to a website. While translating the content of a website, the certified translator needs to address several important issues. When a text is translated into another language, the layout changes. For example, all languages that have an Arabic script are written from left to right, which needs a complete flip over of the page layout to make the copy a mirror image of the original version. Website translation may sometimes require alterations and adjustments to the original version, especially because the font sizes vary from language to language. Some languages like English, Italian, French and Greek are easily readable in a particular font size, whereas other languages like Chinese and Korean are very difficult to read in the same size. A language translator who undertakes the task of translating web content needs to be very cautious about altering page layouts to fit them to the requirements of a particular language. Website translation involves text formatting, linking and coding. Therefore, knowing HTML and CSS is essential for someone translating a website. HTML helps in setting up the structure of a website, whereas CSS helps the user to improve the presentation of web pages by allowing the user to work in different fonts, use colored designs and make necessary changes in format and layouts. Linking between languages on a multilingual website is indispensable. Website owners use several ways to link the languages on their websites. Some sites have icons pointing out material in the respective languages. Some websites show a particular content in English and link it to translated versions of it, which is a good idea because every visitor might not be entering the site through the homepage. Listing languages by their native names or by their names in the original language of the website is the most suitable option, however. Once your website has turned into a multilingual site, you must be careful to update the translations whenever the need arises. Keeping the translations up to date will attract more clients to your website. While translating a website, it is important to anticipate what type of readers will frequent the site. A French translator will keep in mind the cultural dynamics of his country while translating the content into Arabic. Similarly a German translator will slightly mold the original content for the benefit of the German audience of the website. 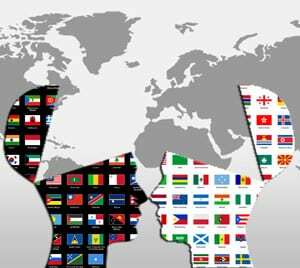 When people of different ethnic backgrounds communicate with you through your website, getting their questions translated and translating your replies to them in their own language is the only beneficial option. This may be time-consuming and arduous but it will increase traffic to your website in the long run. There are many important reasons for using web language translation services. One of those reasons is so you can translate your website to different languages as a marketing technique. Many are now indicating from some research that most web users are probably more likely to devote themselves to business and stay for much, much longer on any web site if it is in their native language. This proves that website translation seems to now be more crucial than ever. a) We now know that there are More than 800 million people online and that in excess of 220 million log into the web everyday in their native language, proving once more website language translation services are extremely valuable for surfing the web for these particular users. b) Research has proved that eight years before the present, the Internet content was predominantly in English – at least 67%, and that figure has now shrank dramatically so to about 31%, showing that website language translation is now becoming increasingly competitive. c) Since 2005, 50% of most of online trading takes place in different languages other than in English, so that website translation is becoming essential to business efficiency. d) With the global rise of multilingual web users growing increasingly, the competition within market place now shows that language translation is becoming ever more important..
e) The incredible rise of Net users who do not understand English or any language other than their own poses problems, problems that can be resolved for them by the use of web translations.